We arrived in Orlando on Saturday and ran straight to ESPN World of Sports for race packet pickup. No time for Star Wars Day at Hollywood Studios, and they were all out of my size in the New Balance Disney sneakers. Booo! Guess that means I have to sign up for another race. Expedition Everest Challenge was definitely a challenge! It's a 5K plus, which means after you do the 5K, you do another couple miles of scavenger hunt in Animal Kingdom park. We solved the clues, mostly, and got our medal in 1:37:02 (47:26 on the 5K). Not bad for zero training on my part (Francis had just done a PT test and I am obliged to tell you he could have done much better than my pace). You generally have an hour or more to kill before a Disney race, and as we walked around we were laughing our butts off at all the bananas, Powerade, Clif bars, compression leggings, camelbacks, and fuel belts. A 5K is three miles! You hardly even need a water stop! Of course, when we got done and realized we had done almost FIVE miles, well, we still didn't need those things. But I did wolf down an AWESOME chicken sandwich and Safari Amber beer at Restaurantsaurus, and that's my food recommendation at Animal Kingdom. Sunday we bummed around our resort for a bit, recovering from our 5 miler (still not eating bananas and Clif Bars) until I felt guilty that it was day 2 and Francis still hadn't seen a park other than Animal Kingdom in the dark. Our dinner reservation at 'Ohana wasn't until 9:30, so off the the Magic Kingdom we went! My first order of business in the Magic Kingdom is the Enchanted Tiki Room. I feel like that really sets the stage for the Disney vision and that ones first trip to the Magic Kingdom should include Tiki Room, Haunted Mansion, Peter Pan's Flight (we had to wait until Extra Magic Hours after dinner to get on this in a reasonable amount of time), Pirates of the Caribbean Jungle Cruise, Small World, and if you're not big on roller coasters, ride the Peoplemover so that you can see the inside of Space Mountain. Also, new favorites! 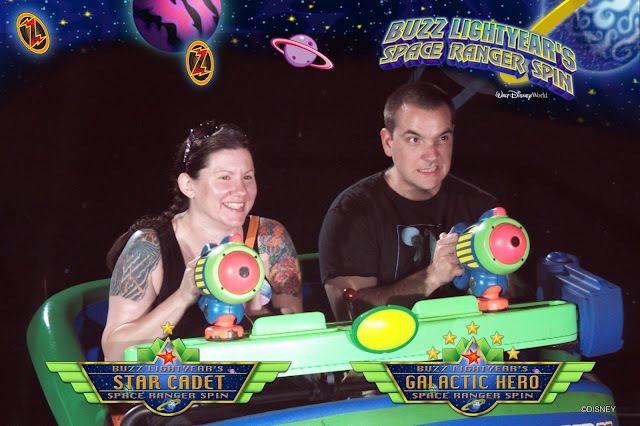 I understand why Buzz Lightyear's Space Ranger Spin is a MUST FASTPASS in the peak season! We got lucky and got on in under 20 minutes during dinner time/extra magic hours. We also got to check out Journey of the Little Mermaid because the line was short, and that was really cute. The queue is really well done, which is something you come to appreciate about WDW when you're waiting in line for an hour. Between Magic Kingdom First Visit and Extra Magic Hours Second Visit, we took the monorail over to 'Ohana for dinner. This is a pretty hot ticket reservation and you would need to book it well in advance in peak season. I got this 9:35pm reservation about 2 months in advance. The big draw at dinner time is the Hawaiian style menu - noodles, veggies, dumplings, chicken wings, skewers of chicken, steak, and shrimp, and the most amazing bread pudding of all time. Also, the Lapu Lapu cocktail, served in a pineapple. Monday was when we really started to make use of the Park Hopper passes. We slept late (from here on out, this is a given) and then spent the day checking out the Flower & Garden Festival at EPCOT, and snacking and drinking our way around the World Showcase - twice! I'll have a post up Tuesday at Craves, Caves & Graves about the Flower & Garden Festival and some of the awesome food. Monday night we had THE hottest ticket: Dinner at Be Our Guest restaurant in the Magic Kingdom! During the day, Beast's Castle is a quick service restaurant, but at night they convert it to a fancy table service restaurant, with Beast as host. I could post half a dozen photos of the food, but I'll just say, we started with the mussels provencal, I had the scallops & shrimp in puff pastry with spinach and carrots, Francis had a steak we will both dream about for months, and we finished with a chocolate cream puff, a strawberry cheesecake cupcake, and a special celebration treat! Tuesday was a pool day. We built in lots of pool time, because there was a bar at the pool with fruity drinks. At night we had dinner at the San Angel Inn at EPCOT. I didn't get a good photo, but this is the Mexican restaurant inside the pyramid. There's a tequila bar for while you wait! Everywhere you go there are flights. Flights of wine, flights of tequila, flights of beer. And you thought Disney World was for kids. Instead of a Mexico picture, I give you a Canada picture, after we downed pints from the UK so we could go into the movie theater for Martin Short in O Canada! Wednesday we made it to Hollywood Studios, briefly. My main objective was to get into the Sci-Fi Drive In. Mission accomplished! I'd heard that the food is unimpressive, but we enjoyed it. It's a burgers and milkshakes kind of joint, and how can you go wrong with that kind of menu and this kind of ambiance? We did some of my favorite Hollywood Studios things, including the Backlot Tour, the Great Movie Ride (5 minute wait! One of the most fortuitous moments of our trip), Muppet*Vision 3D, and the new Star Tours. Holy moly, the update is 1000x better than the old one. I do wish we did that one more that once, but it was one of the hotter days of the trip and we just weren't feeling it. Plus, we had reservations for the Hoop De Doo Revue. OH LORD. First off, let me just tell you that if you are staying at Animal Kingdom Lodge, AVOID AVOID AVOID using Downtown Disney as your transportation hub to get to other resorts. Pick a park as a transfer point. It took us about 90 minutes to get to Fort Wilderness, and then we didn't know that we'd been dropped off at the wrong end and it was nearly 2 miles to the other end of the resort. Lesson learned. The Hoop De Doo Revue is ABSOLUTELY worth figuring out those tricky bits of resort-to-resort transportation. We do a lot of dinner shows, because we are goofy like that, and this was one of the most fun. Up there with Medieval Times. Included in the price of your dinner show is all-you-can-eat fried chicken, ribs, mashed potatoes corn, beans, salad, and cornbread, strawberry shortcake for dessert, AND bottomless sangria and beer. I really think this is a must-do on your WDW vacation. Vier means celebrate in Afrikaans. 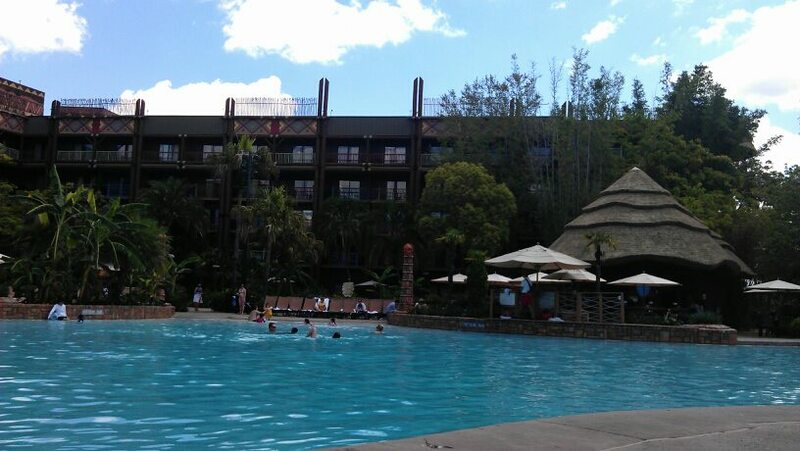 We spent the rest of the day at the pool, until we had to get ready for our safari! Our special treat to ourselves was the Wayama Safari, for guests staying at Animal Kingdom Lodge. You get a private (~10 person) tour of the grounds with some of the keepers, and then have dinner at Jiko: The Cooking Place. Francis will take it from here in Part 2!